The seats are intended to be stretched mesh over frames, so they will be as thin as possible, and breathable for good cooling. The arrangement of the seats are still not settled (nothing really is!) -- the idea is to have the driver sit in the center and to have everybody enter through the rear hatch (which includes much of the rear fascia). The battery pack I've drawing is 6" thick and is 4 feet square (8 cu. ft). The angles are from the highest and lowest points to the trailing edge, and then tangent from the trailing edges. The M-B Bionic concept illustrates that a blunt front is okay, but a low drag car needs to have a very small rear. That explains a large part of the difference between the Cd=0.095 clay model and the Cd=0.20 concept car, which had a relatively large rear. The rest may be due to adding door handles, wipers, ground clearance, and panel gaps. CarBEN's rear is much larger than that of the clay model. As a percentage of frontal area, it's somewhere between that of the Cd=0.25 Insight and the Cd=0.188 EV1. Traditionally, tall vehicles need a wide track for stability. However, going electric and mounting >1000lb of batteries below the floor gives you the option of being tall but not wide. See the Commuter Cars Tango for an example of this. If you can find a way to make your car a foot or two narrower while staying within your project's goals, you'll end up with a much lower Cd, and a much much lower CdA. Such a car should be called the Trout, instead of the Boxfish. A conventional streamlined car has very long overall length to taper its roof down to meet its floorpan. Instead, the Trout is very narrow to achieve a similar Cd with a shorter overall length by having its sides taper inward until they meet. The Trout does well in a wind tunnel, but less well in a crosswind. Thanks for the thought-provoking thread. Neil, how much reference material do you have to go from besides the one picture of the blue mock up model that MB made ? I've been looking for more images of the original model ( the blue one ) but haven't seen any. I think that this project embodies the spirit that Ecomodders have. When car manufacturers tease us with vaporware concepts that they never really intend to build .... we just build the damn thing ourselves ! chassis, you have a better chance of interesting others in your design. would still have a useable trunk/cargo volume. Is this something I can find on Instructables? How would I make a scale sized smoke trail device? This will be an Open Source project! Very important: This will be an Open Source project! I want to have others be able to use anything, or all of the ideas that are used for this. It's the principles of how and why this design can work that is important. Like how open source software -- or scientific peer review works, I think that we need to have open source information; about anything and everything. All good ideas need to be shared, and built up, and revised, and improved -- for the benefit of all. Patents are not working; not in the way they were intended. And good solutions to the world's challenges are too important to "sit on". Okay, a few more points: yes that one picture is the only one I've found of the blue model with wheels. 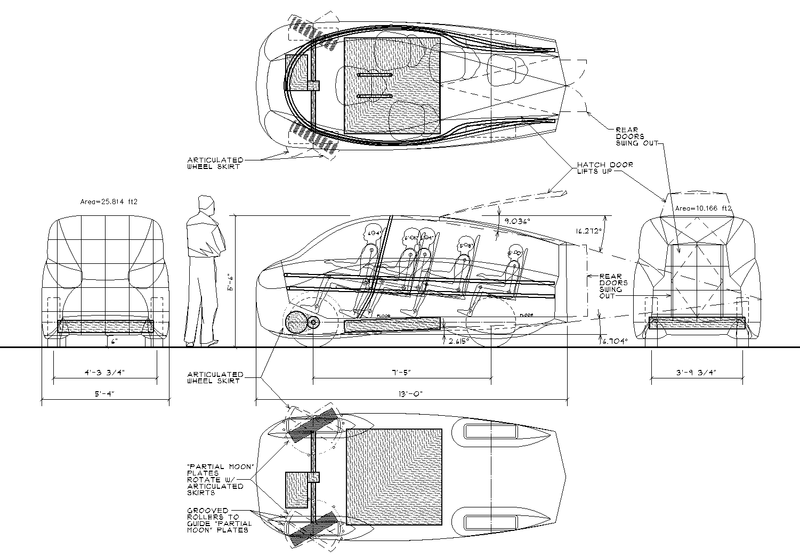 The (slightly revised) frontal area of the drawing of the CarBEN concept is 25.814 sq ft. and the area of the rear fascia is 10.166 sq ft. so the taper is ~2.5:1. Also, please note that my drawing is approximately 4" narrower per side on the rear fascia, than the wood model is. If anybody would like a copy of the DWG file (or the DataCAD AEC file) I'd be happy to send it to you. I hopefully will be starting on the 3D CAD model soon.